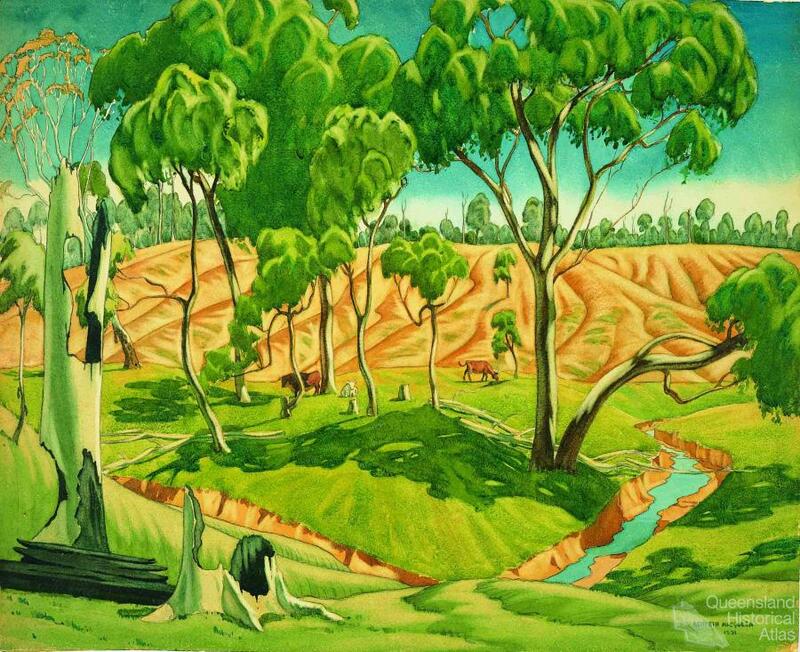 In Adventure in watercolour: an artist’s story (1948), Queensland painter Kenneth Macqueen (1897-1960) called for art that walked ‘steadily and simply and, by its very truth to the environment in which it was produced, [was] distinguishable as to its origin’. His oeuvre is testament to his ability to attain excellence by this measure. 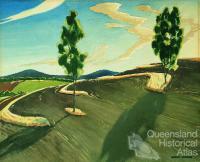 Macqueen’s watercolours, and his map of the landscape they represent, bring to life a place that sustained him financially, artistically and spiritually, and provide a unique perspective on one area of rural Queensland. In 1922, following service in World War I and experience as a jackeroo, Macqueen made the decision to ‘combine [the life of] the artist with [the life of] the farmer so that I might paint only those things which please me’. With his brother Jack he took charge of the dairy farm at Mount Emlyn, near Millmerran on the Darling Downs, that remained his home. He regarded Sydney, where he had spent his youth, as the place to display his work and adopted a style associated with Sydney Modernism – a planned approach to picture-making that emphasised colour and design. 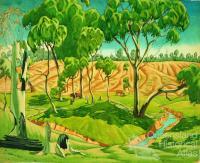 His subject matter, however, reflected his life in Queensland. 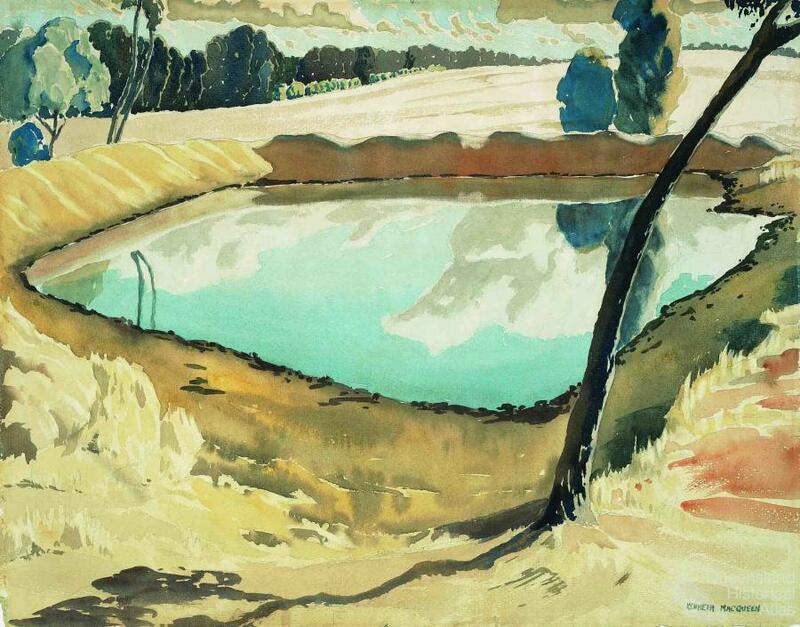 Through striking modern images of his farm like Ploughing the boundary 1928, Macqueen earned recognition as a leading modernist, and the most distinctive watercolourist of his generation. 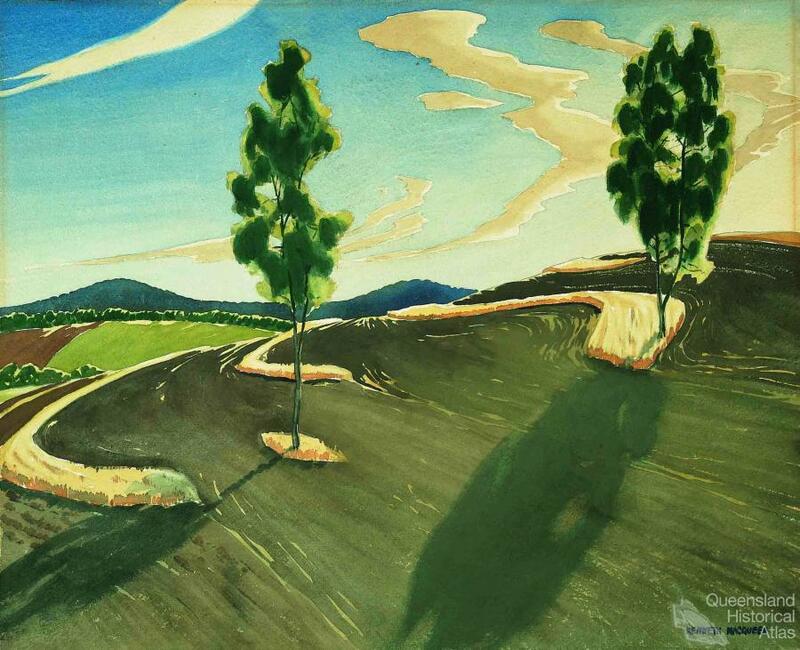 For almost forty years he played a significant part in imaging Queensland, forging a personal idiom and enlivening the genre of landscape painting. When the Macqueen brothers assumed management of the farm at Mount Emlyn, they inherited a landscape that had suffered at the hands of previous settlers – large areas were overrun with the introduced pest prickly pear. In 1924 the Macqueens purchased the 320 acre block with the house, bore and dairy attached, and were given an additional 320 acres, referred to as the ‘Pear block’, because of its poor condition. Brigalow regrowth was also a problem – earlier attempts at clearing had produced virulent suckers that proved difficult to control. Macqueen and Jack, an amateur entomologist, were sensitive to these environmental issues, and Macqueen addressed them directly, and indirectly, in his art. 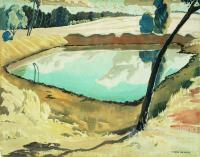 Although he preferred to focus on the beauty and beneficence of nature, a group of paintings that includes Burnt gully 1928 and Cattle and creek 1931 show that he was aware of the problem of soil erosion, and that he had confronted ‘droughts and fire and the host of other hardships of the country’. 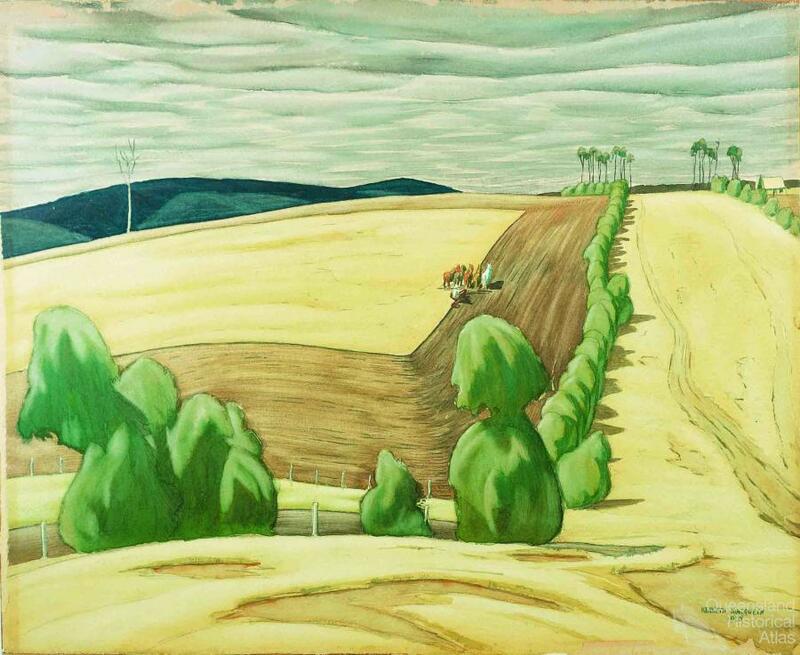 In paintings like Cultivation paddocks on Mt Emlyn c1953 and Harvesting scene c1956, Macqueen recorded the impact of his own farming practice, which he viewed as ‘creative in its way, when one sees a paddock greening under its new crop – the results of [one’s] labours’. Around 1951 the brothers divided the farm, which had expanded to include two neighbouring blocks, ‘Bells’ and the ‘Five Mile’. 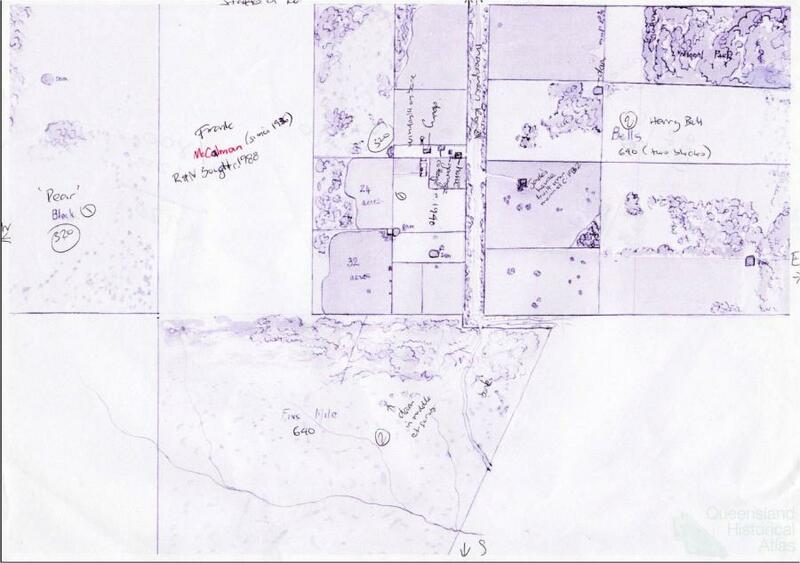 At this time, presumably for posterity, Macqueen made two maps of the property, one for himself, the other for Jack. Sketchy and simple, Macqueen’s map notes the location of the house, dairy and associated outbuildings and even, in the finest pen and ink, the windmills that provided power and the means to shift water. It also documents the location of dams, a vital resource on a farm that lies on a watershed. The importance Macqueen placed on establishing and maintaining a supply of water is illustrated by the many paintings he made of creeks and dams. In The tank c1950, for instance, his focus is the reflective surface of the water, rather than the countryside around it. The brothers saw themselves as custodians of the land and Macqueen’s map records the judicious approach they took to its cultivation. They set aside a tract of approximately 100 acres of mature brigalow and belah forest, dubbing it the ‘National Park’, and in 1943 brought the area under the Fauna Protection Act 1937. The prickly pear was trounced when a South American caterpillar, Cactoblastis cactorum, was made available as a biological control – following this the ‘Pear block’ became simply the ‘Block’. 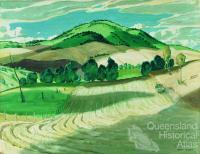 Later in the 1940s, the Macqueens adopted contour ploughing to reduce run-off, and began to retain the stubble from previous crops as further protection against erosion. The technique is immortalised in Contour ploughing c1945, in which Macqueen explores his fascination with the markings his plough has left in the chocolate-brown soil. While the ‘National Park’ was resumed for farming in the early 1960s, its retention for over 20 years by the Macqueens indicates a respect for the land unusual for the time. Kenneth Macqueen did not paint to document. 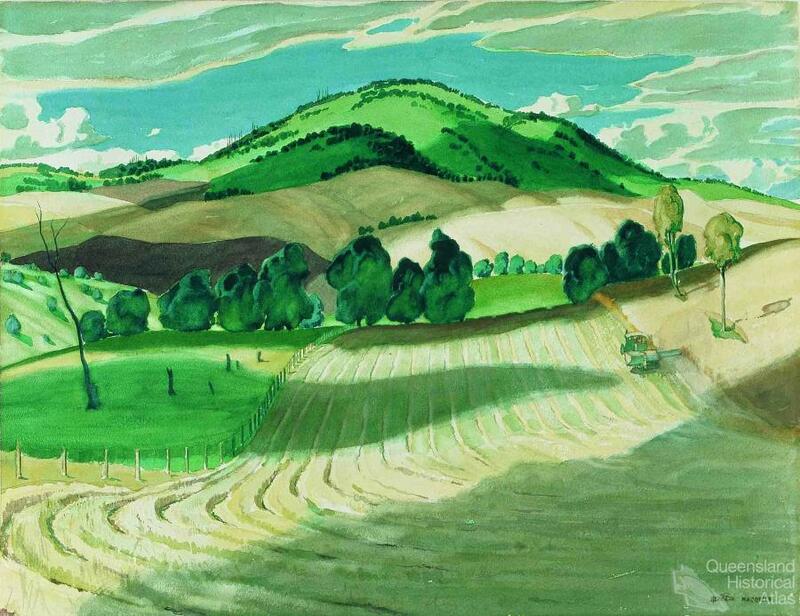 His enduring connection to his property at Mount Emlyn resulted, however, in watercolours that chronicle the land, and convey the joy he experienced in working it as a farmer, and as an artist. 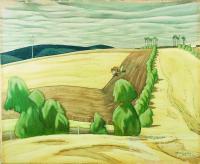 His watercolours reflect a personal yet universal vision of the Darling Downs, evoking its climate and topography. Visitors to the exhibition ‘Making it modern: the watercolours of Kenneth Macqueen’, which opened at the Queensland Art Gallery in November 2007, derived obvious pleasure from identifying places in the paintings, rich with references to the Downs. Many people made the three-hour journey from the Millmerran district to see ‘their’ landscape depicted by an artist who knew it intimately. Through Macqueen’s eloquent artistic legacy, and the documentary evidence of his map, we can share in an aspect of Queensland's visual and cultural history that invokes a time and a place.